Recently, it was my great joy to attend a kind of celebration so rare in our time that it deserves an entire article devoted to it: the 50th anniversary of the loving marriage between two faithful Christians. Their names are Paul and Jeannette, and they have a special place in my heart. I regard them as elders on my own spiritual journey. My wife and I look up to them as examples of a loving Christian marriage that has endured and continues to thrive. As a priest, I see them as paradigms of true lay service in a Christian community. Noteworthy as this couple is, though, their golden anniversary celebration was characteristically understated. One of the Church ladies cooked the supper, which consisted of ham, turkey, mashed potatoes and veggies. Dessert was a wedding cake baked by a friend. The drinks were served in plastic cups, the food on paper plates. The entertainment was equally unpretentious. My wife and daughter sang “Bound for the Promised Land.” Paul and a friend did a duet on fiddle and guitar. Another old friend of the couple (who herself had just celebrated her 51st wedding anniversary) told some jokes. It felt like an open mike at a family reunion. One of the highlights of the evening came when Paul got up and spoke to his wife in terms of tenderness and endearment that brought tears to our eyes. 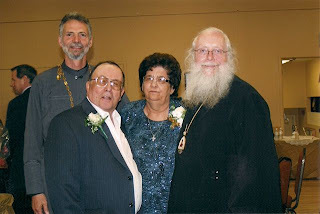 Following this, our own Archbishop Seraphim, who was seated at the centre of the head table, awarded Paul and Jeannette a grammata, a traditional certificate recognizing their past and continuing years of faithful lay service to the Church. Leaving this simple and down-to-earth event, I was struck with a sense of having witnessed something both beautiful and dignified: two lives of steadfast faith lived in complete and loving union for over five decades. You might ask, as I did, how they managed it? If you think that Paul and Jeannette had it easy in some way, you would be wrong. Financial struggles and hardships dogged them for years, and now they live without savings on their Canada pensions alone. They suffered too in the raising of their children, with illness and death and every kind of sorrow, which they were often helpless to do anything about, except pray. And no doubt, they worked through the familiar daily difficulties of a working marriage. Then, 18 years ago, Jeannette had a kidney transplant. Ever since, she has struggled with the anti-rejection medications, often being so debilitated that she is confined to her bed. Heart attacks, deadly bouts of pneumonia, 27 operations—these are some of the sufferings Jeannette has endured, with Paul steadfast by her side. In other words, their life together has been no easier or more ideal than anyone else’s; and more often than not, it has been more difficult. Yet Paul and Jeannette have maintained their marriage in love and faithfulness to each other, while preserving their belief that God holds their relationship in His providential hands. Are these people somehow “super” Christians, possessing extraordinary inner resources that allowed them to weather the storm? Perhaps, but it’s unlikely. From what I know of their personal spiritual lives, I am aware that they have cultivated the habit of praying daily for everyone they know. I recall, for instance, visiting them and seeing a photograph of myself and my family hanging with several others in the corner where they go to pray—reminders of those whom they commit to God’s care every day. And what of the grammatta, the certificate that the Archbishop presented in honour of Paul and Jeannette’s exemplary service to the Church? For Paul, “exemplary service” means a regular cleaning of the building, and restocking candles and supplies. For Jeannette, it is even more basic: she attends and contributes to every Church event that her weakened body will permit. They are simply faithful people, who over the years have continually supported and encouraged their leaders and their community as best they could. Their choice to seat the Archbishop at the centre of their head table was more than merely accidental. For Paul and Jeannette, Christ and His Church are the centre of everything. I have told this dear couple’s story, because in my limited experience, there is no shortage of those who long for power and glory in Church, who are zealous to improve and fix and reshape communities according to their personal vision. There is no end to the line of people who enjoy titles and honours, who would like their names on plaques, who dream of being toasted at banquets and applauded by congregations. But extraordinary indeed are people like Paul and Jeannette, people who do not obtrude, who struggle quietly and are victorious without fanfare; who serve in whatever capacity they are needed—no matter how simple and lowly the task—cheerfully and steadfastly and without complaint. Rare indeed are the people who live whatever lives God gives them, offering up everything and everyone they encounter to Him. Don’t get me wrong; we need leaders, visionaries, movers and shakers. But as we seek to raise up those folks to do their work in the limelight, let’s not forget to honour and treasure those in the wings, who come early and stay late without being asked; who encourage without fail; who can always be called upon on in a pinch; who are cheerful, prayerful, and humble. Let’s not forget the faithful ones; they are truly worthy of our praise.